Lately, I've been doing a lot of thinking about divergent paths the Hulk might have taken in his long, storied history. My attention kept turning to what is arguably the biggest turning point of them all, which should be familiar to all accomplished Marvelites who read the series in the 1980s. Of course, I'm talking about the time when Bill Mantlo came full circle with his renovating of the Hulk, taking him from the classic savage incarnation of his early run, retreading the traditional tropes; through a two-year period where the Green Goliath possessed Bruce Banner's brain; and finally a year-long period wherein the Hulk possessed none of Banner's intellect, becoming instead a nearly-mindless behemoth akin to a newborn just learning about himself and his abilities. When the Hulk found himself nearly where he began his journey under Mantlo's talented pen, where would the next writer take him? Who would chart that course, be it backward into potential stagnation, or forward into some bold new era? John Byrne has always had an intense reverence for "the way things were," which is to say an affection for the very early Marvel Age (c.f. the Lee/Kirby period in Fantastic Four), and his treatment of Incredible Hulk was, on the surface, no different. His stated objective was to return the character to his roots: the original six-issue series that ran from 1962-1963 and was originally canceled to make way for another title in Marvel's tiny distribution deal with DC (claimed in many sources to be Amazing Spider-Man, but more likely Sgt. Fury and His Howling Commandos, as its first issue shipped exactly two months after the last Hulk). Of course, he aimed to provide a consistency largely absent from those early issues (which had doubtless led to the original cancellation). He believed the Hulk had, in intervening years, accumulated a number of problems, all of which he could solve during his tenure. The first problem was solved in the initial switching of creative teams with writer Mantlo. As Byrne stated in Amazing Heroes, "The Hulk has to be on Earth; he has to be somewhere that your average reader can relate to, even if it's New Mexico." Hence, the Beyonder, the godlike force behind Marvel Super Heroes Secret Wars and its then-current sequel, Secret Wars II, tricked Alpha Flight into bringing the Hulk back from the Crossroads dimension (where he'd been trapped in the final year of Mantlo's run) to serve as host to the disembodied consciousness of their fallen teammate, Walter Langkowski, aka Sasquatch. (Langkowski didn't get the Hulk's body, naturally, but would eventually return in the body of another deceased Alphan, the very feminine Snowbird, during Mantlo's work in that series.) Returned to Earth, the Hulk now possessed "a quasi-mystical homing instinct [...] so that wherever he is on Earth, he is oriented to the place where he was created. He knows where it is. He can get there." This ability actually laid the foundation for later writer Peter David, who would later explain the ability away by saying the Maestro, the evil Hulk of an alternate future who'd died at ground zero of the original G-bomb detonation, was actually "calling out" to his younger self, absorbing gamma radiation so that he might reconstitute. (See Incredible Hulk: Future Imperfect and Incredible Hulk #460-461.) Regardless of the ability's genesis, the point was made that the Hulk could and did find the desert where he was born, and Byrne's adventures would take advantage of the original New Mexico locale, which is unique in comics in the Lee/Kirby sixties, Byrne's eighties, and now. Another issue Byrne identified was the Hulk's very demeanor, which had shifted considerably from the original, malevolent creature who existed by night and often sought to conquer. 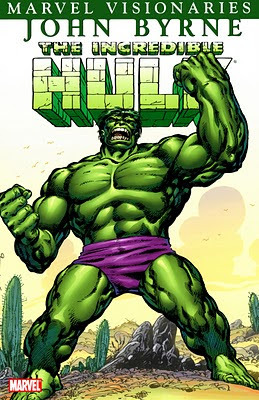 Writers like Len Wein had developed the Hulk into an altogether different character--the "savage Hulk" incarnation, as later writers dubbed him, but which Byrne called something different. "I enjoyed Len's Hulk, the sort of capital 'G' Goofy Hulk. The slow-witted likable Hulk. I think it was Jim Starlin, or possibly Berni Wrightson, who said the Hulk was Marvel's Goofy," he said, referring to the Disney character--lovable and rather stupid, but with flashes of cleverness in his own unique way. Byrne preferred to liken him to Donald Duck, "because he reacts to everything at the same level, and it's all rage. Everything gets him angry." He wanted to restore the more primal Hulk of older vintage, constructing a scene in issue #314 where the Hulk kills a deer and just leaps away, whereas Wein's Hulk would have patted the animal on the head and said, "Nice deer." Here is where Byrne's vision seems least obvious in the seven issues we got, for in the majority the Hulk is much the same mindless behemoth we'd just gotten rid of in Mantlo's Crossroads story, although for vastly different reasons. (Mantlo's Banner committed psychic suicide, leaving the Hulk in a near-mindless state, whereas Byrne's monster was physically separated from Banner.) Only if we examined Byrne's unfinished plans would we see the hints of the original six issues in them. Thirdly, Byrne wished to address the lack of a respectable rogues' gallery for the man-monster. In his first issue, he prominently featured five Hulk villains which he stated would never appear again under his tenure--the Leader, the Abomination, M.O.D.O.K., the Rhino, and the Juggernaut. Why retire them? "[B]ecause for the most part I feel they have been done to death. The Hulk has never really had a good rogues' gallery. He's tended to collect other people's bad guys, like the Juggernaut from The X-Men, like the Rhino from Spider-Man, and like Modok [sic] from Captain America." Remarkably, the six regular issues Byrne wrote and drew never featured an actual "Hulk villain"; in addition, the annual he wrote (#14) introduced a new villain who was killed in the same issue. The only villains Byrne wrote whom the Hulk fought before, Hammer & Anvil (from Incredible Hulk #182), only appeared in a story published several months after his run concluded, in the anthology title Marvel Fanfare (#29). But he had plans for at least one Hulk villain to return, with an unusual variant on another. Because of the sheer length of this article, I'm splitting it up in three segments: this, the introduction, where I explain what I want to do; the second segment, wherein I review what Byrne actually accomplished during his eight-issue stint (counting the annual and Marvel Fanfare), comparing it with his intentions from the Amazing Heroes interview; and the final segment, wherein I cite the reasons for his exit from the book, chart the course he wanted to take in issues #320 and beyond, and compare that intended status quo to what eventually occurred. It's fair to say that the Hulk would likely be a very different character today if Byrne had been able to complete his journey. Although the stories themselves may be lackluster in certain facets, The Incredible Hulk #314-319 really are some of the most influential comics to feature the character in the 1980s, the pivot around which much of what follows revolve. In such a context, it's even more fascinating to think about those what-ifs, those might-have-beens. As they said in the swingin' sixties: "HULKINUED!" I'm a big John Byrne fan. I've never heard anything about what he wanted to do with the Hulk beyond the few issues of his 80's run, which was, for me, a mixed bag, and I very much look forward to hearing about it. for me, Byrne's 80's run on the Hulk, taken on it's own, is some amazing, inspiring artwork with a mediocre story. It seems so short because it seems like he only had one basic idea and not many places to take it. It is in comparison with any given six issues of PAD's run that Byrne's run truly suffers. The difference in the approaches the two writers take is vast, and where PAD's approach is one of unbounded imagination and a joy in characterization and in mining the concept for new ways to develop the character, Byrne's is one of imaginative stinginess; the impression being given that he COULD use his imagination and sense of humor to explore new ideas but he doesn't feel like it, that he has instead chosen to narrow his focus to a perspective as thin as a laser. It's as if he is sitting completely still and daring you to spot him twitch his finger or move his head. He presents his Hulk story all at once, and says, "there ya have it". Any given scene in Byrne's Hulk run, such as the scene with the deer, or the scene with Bruce in the Hulkbusters lab explaining the Hulk to Betty, kind of sums up the entire run. You can read those scenes and imagine the rest and as long as you don't imagine too hard, you'll get a good approximation. By contrast, throughout PAD's Hulk run each scene is unexpected and deliriously entertaining, and one could not predict what might happen next, but couldn't wait to find out, and when we did it was consistently unexpected, entertaining, and satisfying. In the late 80's and early 90's, PAD at Marvel, and Giffen and DeMatteis at DC, were blowing the conventions of superhero characterization wide open. This was an exciting time. Today so many writers have been influenced by their work that it seems common place, but they were truly groundbreakers. I always felt like Byrne missed his chance with his Hulk run, because he chose to produce something very workmanlike, which would meet expectations exactly and not exceed them. Despite the destruction the Hulk's rampages cause, Byrne's run seems unobtrusive and cautious. Splitting Banner and the Hulk was indeed an exciting idea worth exploring, but once it was established very little of interest was done with either of them. How was he to know that PAD would hit the ground running and wow the crowd consistently for the next 12 years? If he had, maybe he would have brought more of an A-game. I am reminded of the conflict between Salieri and Mozart in AMADEUS; Salieri's character produced exactly the music his patrons wanted and was well rewarded for it. Then along comes Mozart who produces phenomenal, protean work that amazes everybody and suddenly no one is interested in Salieri. Salieri had done what was expected and had not expected such unprecedented competition, and was left feeling quite bitter from unfavorable comparison. Quantum, I hope you enjoy what I bring to the table with the next few entries of this series. It's true, if you just look at the six regular issues that were released, there seems to be very little story actually going on. That's why I feel it's so important to get "under the hood" and look around. What I found in the Amazing Heroes magazine really surprised me. I'd heard rumors of what was due to occur, but still, there's nothing quite like actually seeing a creator's words. Very good article,Gary. I discovered the Amazing Heroes interview you mentioned last year and have discussed it with King Hulk a few times. I agreed with Byrne's approach to writing the Fantastic Four,which were some of the best Marvel Comics of the 80s but there are many I disagree with on his views of the Hulk. In particular his views on the 'savage hulk'. If I remember correctly he called that period as part of the "70s DCaziation of Marvel'. I will go into more detail on this later. A well timed analysis of a faacinating period in the Hulks hstory, I remember it as very striking visually given the pairing of Byrnes sharp art and Andy Yanchus' eyewatering coloring job! But in terms of substance it was indeed much ado about nothing. Those six issues coould be condensced into three and you would miss nothing from the plot, it's all very functional and lacking in life or spark. 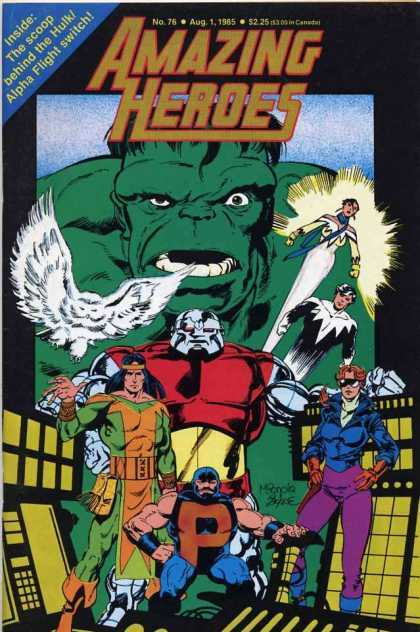 As you rightly point out though Gary It is nontheless very very noteworthy in what it inspired after the event, the sequence of events coming out of it might well never have happened, I've always wondered for example whether the return of the Gray Hulk could have ever come about without this storyline and Byrnes stayed roadmap setting it up for Milgrom to trigger. Without a doubt it's the Gray Hulk who saved this book at that point, even in #324 this is a very dynamic and much more exciting character than we'd seen in many years and at a time when comics were becoming highly sophisticated and more complex in structure and content I don't think the Hulk of old would have fared well at all without this more radical approach taken and a stroke of fortune in getting a gradually rising Writer and artist with ambitions and something to prove. When you look to John Byrnes short run and compare it to what else he did in this era (Fantastic Four, Superman) it would be easy to argue we missed out on a slowly cooking treat, but to have six-plus issues and not at all much occuring in them suggests this was a case of someone totally unsuited for the character. But I don't think there are many who could have taken the Hulk out of the rut it was in at the time, The Crossroads arc had slowly fizzled to nothing and the character was looking a little fatigued compared to what else was going on around him at the time. My Styx, thanks for your kind words regarding this first section of my little series on Byrne's Hulk. Here's hoping you enjoy the remainder. You've hinted at a bit of what I've got in that third segment, although I definitely attack it in a different way. Today in fact I had an additional revelation and I'll be updating that blog prior to its eventual release next week (also taking some cues from other Byrne interviews from the period). I can honestly say I haven't seen any analysis of the type I've been doing anywhere else out there, so I'm thrilled to be bringing it to you and to any other fans who welcome it. When you think on it further and consider John Byrnes writing style he is always marked out by his preference to write very cerebral, highly rational, thinkers as his leads. Reed Richards, James Hudson, Hank Pym, Superman, Namor, even the villians like Doctor Doom and Immortus follow the same template, this isn't any slight on his style as at that time it was highly appealing and intelligent writing. I think the problem was that on reflection Bruce Banner is, and always was, a very fragile, vulnerable, and emotional man. The struggle to suppress the Hulk as well as being constantly on the run is what sperated him from his contemporaries and defined him to a large degree, when Bill Mantlo put him through his final arc by having Banner finally come to terms with the Hulk and gain control at last (#272) and then gradually lose everything due to forces outside his control to the point he was left suicidal (#299, 313)... Those were very affecting issues as this wasn't a scientist or rationalist, it was just a very tired human being in need of reassurance & counsel. With Byrnes treatment immediatly splitting off the Hulk from Banner a lot of Banners psychological conditioning and reinforcement was instantly rendered void, but emotionally what is left was curiously noteworthy as being very cold and detached - I have always wondered if that aloofness and lack of life in Banner was a delibrate plot point on Byrnes part. Look to his flat, monotone, lifeless treatment of Banner compared to the warmth of Reed Richards' more rounded character in his FF run for example, or James Hudson in Alpha Flight, both of those are similar types of people to Banner and handled by Byrne in very similar ways, they have humor and they have very warm loving relationships that reinforce them. Byrne's Bruce Banner by contrast is emotionally repressed. A shell. I do wonder if this was going to be addressed whan he finally got to the point where he would re-merge Banner with the Hulk...? For all the criticism levelled at this run it is a criticism also lacking any undrstanding of what Byrnes longterm objectives were, if it was his intention to revert the character back to the more brutal Lee/Kirby Hulk then clearly that violence would have to come from not just the animalistic Hulk Banner had seperated from but also in some way Banner himself - he is the Hulks brain after all. When making an attempt at Assessing this run it's a tough one to do as it is colored and compared to some extremely solid and well regarded works the creator was doing at the time and which have stood the test of time since - Alpha Flight, FF, Superman and much more, by comparison to any of which his work on the Hulk was surprisingly slow and thin on substance. Dave M., thank you for your insightful comments about Byrne's run! As deep as I dug into things, I never put everything together like you did, with Banner on the surface fitting the mold of Byrne's other famous leading men. Interestingly, the writer directly addresses your "cold, detached" Banner ideas and much more in the remainder of the Amazing Heroes interview, which I'll be covering in the third and final chapter. I'm anxious to see your thoughts on that piece next week. Its too bad Byrne could not keep his cool and play in the marvel sandbox and complete his run on Hulk in a professional manner. Instead he pulled one of his classic hissy fits and left mid run (like he did on She Hulk, Avengers, AWC, WW and too many titles to mention). He has definitely lost his luster these days - he was an innovator at marvel back then but his work since the mid-90s has been dull, cliche, with rushed artwork. His old stuff was better. Mostly speculation on my part, but I wonder if John B perhaps jumped at the chance to do the Hulk merely because it provided an opportunity to get off Alpha Flight, which he was kind of bored with at that point. If so, perhaps his plans for the character sprang more from having to come up with something PDQ, rather than because he was fired up with a definite direction for ol' Greenskin. Six issues in, not quite sure or satisfied with where he was going, he jumped ship when an excuse presented itself. I rather think it would have appealed to John to have a pocket six issue run just as Stan & Jack (and Steve) did. As I said, speculation on my part, and not a pop at John Byrne - I loved his FF. One thing that was very evident from the interviews was that Byrne was indeed getting--maybe not bored with Alpha Flight, but had told all the stories he wanted to tell. The plans for Mantlo to continue on with the Hulk were, well, questionable to say the least, so in a way it's good the creative trade-off occurred. What I meant 'though, was that I was wondering if those plans arose AFTER he landed the Hulk gig (because he had to come up with something), or was he taking the Hulk in a direction that he had long felt ol' Greenskin should be headed in - even before he ever thought he might write and draw the character? I'll certainly read the other relevant posts when I can. ""The Hulk has to be on Earth; he has to be somewhere that your average reader can relate to, even if it's New Mexico." "Byrne preferred to liken him to Donald Duck, "because he reacts to everything at the same level, and it's all rage. Everything gets him angry." He wanted to restore the more primal Hulk of older vintage, constructing a scene in issue #314 where the Hulk kills a deer and just leaps away, whereas Wein's Hulk would have patted the animal on the head and said, "Nice deer." He thinks readers needed the Hulk to be someWHERE they can relate to, but not someONE they can relate to. After all, for all that we humans do get angry, we don't remain angry 24/7. We don't engage in continuous, sustained bouts of anger that lead to the destruction of people and things around us. I wish he'd have left it at "this is the Hulk that I want to write" versus implying "this is the Hulk that readers want".